Our product range includes a wide range of polyester strapping tape. 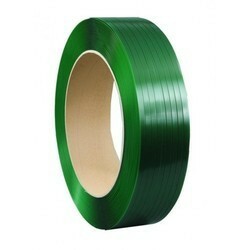 Leveraging on our vast industry experience, we offer an extensive range of Polyester Strapping Tape. The offered range is designed in conformity with international standards using quality approved base material with the help of current and sophisticated technology. In order to meet the varied needs of the clients, it is offered as per their application requirements. Clients can avail this product in large quantity within the predefined time - frame. This strapping is provided with an efficient manual and powered tools and line of semi-automatic & fully automatic high-performance strapping machine, hence highly recommended by our renowned clients.